FUN ,BEAUTIFUL DESIGN -Your kids deserve better alarm clock! Multifuction wake up light alarm clock create a colorful fantasy. Designed for children to sleep and play with - touch the top to dim or adjust the light color. Light gradually brightens when the alarm goes off to gently wake you up. Features a Sleep timer to gently dim the room and can also act as a night light. FUNCTIONAL ALARM CLOCK - Gradually waking up to light with your choice of nature-inspired sounds is a pleasant way to start your day. Features an easy to hit snooze button to pause the alarm and turn off the light and sound for 5 mins. 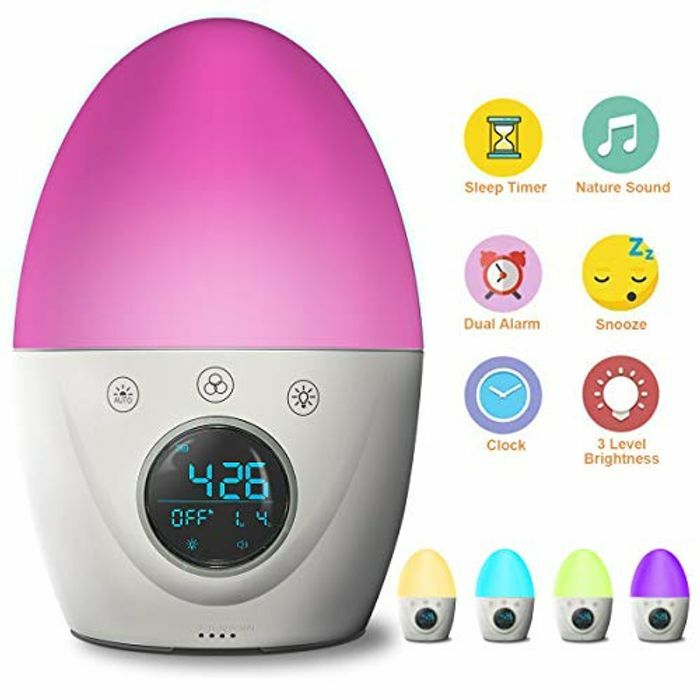 Features：weekday option alarm, 2 alarms, adjustable alarm volume,12/24hour, Nap function，backlight dimable, sleep timer . TOUCH CONTROL COLORFUL LAMP - Warm White Light Mode with 4 levels brightness, Dynamic Light Mode with RGB color changing supports 48 colors. Release soft and comfortable light to make you ease and delight.Touch activated and full control the light Brightness,color and power on/off.You will have fun when you keep touching it! LONG WORKING HOURS- Equipped with a rechargeble 1800mAh premium battery, supports at least 80 hours CLOCK/4.5 hours on medium-brightness light, usb charge , only needs 2 hours to fully charge it! DECENT GIFT WITH FULLY GUARANTEE--Durabble and safe construction - Comprised of child safe ABS and silicone, FCC approved.Ideal gift for baby, kids, teen boys or girls, women and adult. Thanks Giving Day Christmas Housewarming birthday party gift. 1-YEAR WARRANTY! This is quite funky looking, great find! Perfect for Christmas! Thanks so much for sharing!